I am realizing it has been nearly a full year since I last wrote you a letter my sweet girl. I never intended it to be such a long time in between however life has been quite full and busy with you and your daddy the past 10 months. Since I last wrote to you you have grown by leaps and bounds both in your vocabulary and your personality. In October of 2014 we took your very first train ride into Grand Central Station to celebrate mommy and daddy’s wedding anniversary and to visit your little cousin, Milo. You were so excited to see all of the people and insisted on running down the street instead of observing from your stroller. We walked an awful lot of “long blocks” to give you more time to run and you loved the ferry ride across the East River to Brooklyn. Our Christmas that year was also celebrated with your little cousin who came to visit us this time. We were excited to enjoy the company of family but also eagerly awaiting our big family vacation that was only about a month away. For your second birthday we joined Mema, Papi, Uncle Matt, and Sam on a once in a lifetime vacation to Universal Studios and then set sail on a cruise through the Caribbean. While we were at Universal you and mommy explored the house of Curious George where we discovered lots of ways to politely soak the people walking by with ice cold water. Of course there were a few surprises that got us as well. You enjoyed an animal show with Mema and Papi and loved to explore the hotel we were at. Our cruise was quite magical and we got to visit beaches in Jamaica, Grand Caymen and on your second birthday we had a special lunch in Cozumel, Mexico. On the ship you were so excited to have a special dance party with Dora when we returned from our adventure in Mexico. During our time away you really started to put sentences together and have not stopped talking since. Mommy and daddy love to chat with you and hear about your dreams, what’s happened while you were at school and listen to you read your favorite books that you’ve memorized. Some of your favorite stories to read at the moment are “Amazing Frogs”, “Silly Tilly” and “The Little Mouse, The Red Ripe Strawberrry and the Big Hungry Bear”. You love to help mommy water the garden and clip lettuce for our salads. You love to eat all types of food and you almost never stop laughing and smiling. One of your favorite things in the whole world is sing. You are constantly singing a variety of songs such as “Mary Had a Little Lamb”, “Ba-ba Black Sheep”, and “Take Me to Church” by Hozier which is quite adorable. Most recently you have started singing “Part of Your World” from the little Mermaid. You sing over and over in a quite voice “Wish.. I.. could be…” then in a loud powerful voice “Part of your wooooorllld!!! When’s it my tuuuurrnnn!”. Then you repeat. 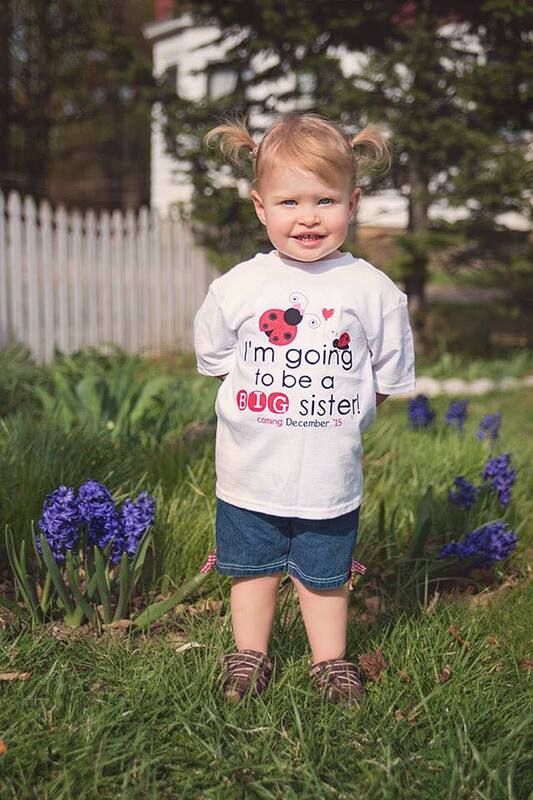 You recently learned that for Christmas this year we will be having a new baby and you will get to be a big sister. You seem excited but also informed us a few times that “I’m not a big sister, I’m Sylvia Chanel Pierce!”. Life is truly perfect with you in it and we are so excited to watch you become a big sister and a strong and beautiful woman. We love you baby girl!